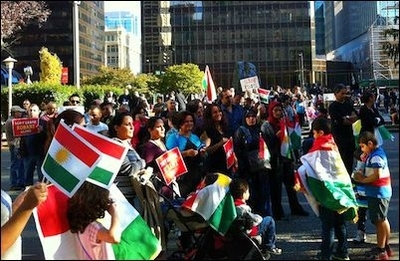 Canadians of Kurdish descent, shown here at an October 5 demonstration in Vancouver, feel betrayed by the country's politicians. For the past 48 hours she has been witnessing the battle raging in the Kurdish town of Kobane, just south of Turkey's border with Syria. At 07:00 EST on Monday she tweeted, "ISIS did not manage to enter Kobane yet, Kurdish activist Mustafa Bali just told me over phone. He is still in #Kobane. @Akhbar"
An hour later, she was the first to report: "I can confirm. I just saw an ISIS flag. It is flying on eastern edge of #Kobane. Will try to tweet a pic in a sec." Moussa's tweets from one of her Kurdish contacts from inside Kobane conveyed the sense of betrayal the Kurds felt because of the lack of American help. She tweeted: "Kurdish guy from#Kobane tells me: We hoped American planes will help us. Instead American tanks in hands of ISIS are killing us." The betrayal of the Kurds was not just taking place on the ground in Syria. Closer to home, many Kurdish Canadians felt abandoned by politicians. Keyvan Soltany, a Kurdish exile and human rights activist, told me he felt both the Liberal party and the NDP were catering to the large "Muslim vote bank" in the cities, instead of uniting as one voice with Prime Minster Stephen Harper. It was a surreal experience to follow the battle ground tweets by Moussa and listen to the NDP's Thomas Mulcair and Paul Dewar read well-scripted rhetoric opposing military air strikes against ISIS. Dewar had the audacity to ask Foreign Affairs Minister John Baird whether he had exhausted all alternative means of helping the victims of ISIS barbarism. He sounded as if he was debating the Haiti earthquake disaster, not the man-made catastrophe unfolding in front of our eyes across the world. Both Mulcair and Liberal Leader Justin Trudeau should have been aware of the threat the Islamic State poses to Canada and our allies, be they America, Europe, India or Israel. Later in the evening on CBC's Power and Politics, I heard an exchange between host Evan Soloman and Trudeau's defence adviser, retired Lt. Gen Andrew Leslie. If this is the advice the Liberal leader is getting, then it is no surprise, he knows not what he says. LESLIE: "Probably the largest single threat to Canada is the ungoverned, those poor desperate people tucked up against the Turkish border, who if they get the sense of abandonment, and get frustrated and get panicky even more so than they are now, that will act as a fertile breeding ground for the next wave of fundamentalists, who may decide to do unpleasant things to those around them or to us ... "
SOLOMON: " But Andrew Leslie, are you actually saying that the greatest threat to Canada is the refugees, not the terrorist group ISIS?" LESLIE: "No, no, absolutely not." SOLOMON: "Because you said that is the potential bigger threat." LESLIE: "If left ungoverned, if left unhelped ..."
SOLOMON: "It seems to me the people beheading might be the bigger threat." I dread the day Trudeau is prime minister and Leslie his defence minister. Tarek S. Fatah is a founder of the Muslim Canadian Congress, a columnist at Toronto Sun, host of a Sunday afternoon talk show on Toronto's NewsTalk1010 AM Radio, and a Robert J. and Abby B. Levine Fellow at the Middle East Forum. He is the author of two award-winning books: Chasing a Mirage: The Tragic Illusion of an Islamic State and The Jew is Not My Enemy: Unveiling the Myths that Fuel Muslim Anti-Semitism.